This project targeted a fast-growing group of particularly vulnerable underserved middle and high school students – English Language Learners (ELLs) in their first year in the U.S. educational system. This project leveraged existing resources – the Jefferson County Public School (JCPS) district’s unique “Newcomer Academy” for first year middle and high school ELLs; a long-standing university planetarium directed by a K-12 science educator with a new portable planetarium initiative enabling visually rich science instruction to be taken to the schools; and ELL expertise of researchers who have been collaborating on content-based ELL education initiatives. The goal of the project was to offer immersive, visually rich, and dynamic presentations in a portable planetarium dome (“visualizations”) to support student learning of complex science concepts while minimizing English language barriers for a population of English language learners. The University of Louisville planetarium educator, utilizing the Owsley Brown II Portable Planetarium, closely collaborated and planned with the science teachers (one middle school teacher with 3 science classes, one science teacher with 4 science classes). 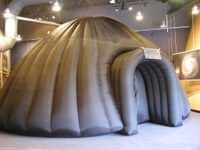 The visualizations were developed and tuned to match the curriculum needs of the teachers, and specific scripts, including literacy supports, were coordinated so that the learning experiences in the classrooms were directly related to the learning experiences in the portable planetarium. Mark Duckwall, planetarium educator, summarizes the planetarium’s capabilities and how they fit the education goals of the curriculum. Eric Bookstrom, science teacher, gives an overview of his background, the unique needs of his students, and how the planetarium fits into his work. Thanks to the Sutherland Foundation, Inc. for funding the project and to the teachers and principal at Newcomer Academy for their collaboration.